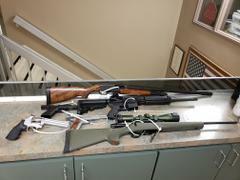 Man arrested and weapons seized in Altadena yesterday evening. Yesterday at 5:38pm disturbance call was reported at the 2100 block of Garfias Drive in Altadena. We had two units responded with lights and siren, along with several other deputies. It was believed that one of the persons involved had a rifle. A helicopter was called in along with units from Pasadena Police Department and Crescenta Valley Sheriff Station. Several adults were detained while deputies determined what crime had occurred inside the residence. Deputies had learned one of the persons had several firearms in their possession. After a search of the residence a revolver, two semi automatic handguns, two rifles, a shotgun, and several boxes of ammunition were removed. A male adult was arrested for a felony and misdemeanor charges.